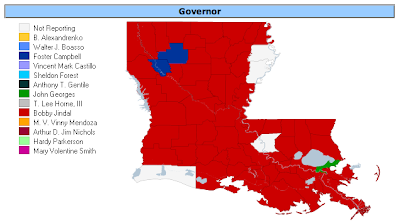 I do believe Louisiana has done one of the smartest things in the history of the state. They elected a Rhodes Scholar as the next governor -- at least that is what the unofficial results are saying. In LA if a candidate gets more than 50% there is no runoff the following November. I hope Bobby has more plans for recovery of the Gulf Coast than Blanco's great plans of using the surplus of money the state received for recovery efforts to build roads in North Louisiana. Great news about Bobby Jindal. Though remember that Pres Clinton was also a Rhodes Scholar - so that is no qualification by itself. He will have quite the uphill battle.